A runner used the Asics GT 2000 4 for a half-marathon and he wrote that it kept him comfortable and safe from knee aches. The vibrant colorways for this model were lauded by consumers. The underfoot cushioning system was responsive, noted many testers. The shock absorption capability of the Gel® Cushioning System became a highlight for runners. Several testers took note of the efficient mid-foot stability mechanics, which didn’t allow their feet to roll inwards unnaturally. A number of runners commented that this shoe remained strong and durable, even after many uses. Some users said that the upper fabrics were able to hug their feet securely, just like a glove. A runner claimed that wearing the Asics GT 2000 4 significantly diminished ankle pain when running. There were consumers who stated that this shoe was great not only for running, but also for casual use. Some runners noted that the sole unit was so jam-packed with features that it limited the flexibility of their feet. The exoskeletal heel counter caused the inner fabric to rub uncomfortably against the skin of some runners, resulting in some blisters. A few of the testers felt that this this shoe’s toe box was uncomfortably narrow. The Asics GT 2000 4 gained a lot of fans because of its comfortable features and stability mechanics. Those with over-pronated foot motion felt that it supported them well. Many said that it was constructed well, that it remained durable even after many uses. Inversely, some complained that it was unpleasingly narrow; others claimed to suffer from blisters because of the fabric rubbing against their heels. The ASICS GT 2000-4 inspires confidence. When looking at these shoes, you can see the quality construction in every area from materials, stitching, padding and reflective strips. This shoe has been a long time in the evolutionary process, changing a little every year and getting better with each new version. These are the shoes you pack when space is limited to only one pair. I ran in Tanzania for 3 weeks in January. Around and around the orphanage not wanting to stray too far, on earth ground almost to fine dust by civilization dating way, way back in time and yet these shoes are still sure-footed on every surface and vented well for the African summertime heat. I often look forward to upgrading my present shoes for an even better experience but with the Asics GT 2000, there seems to be no place to go from here. The ASICS GT 2000 shoes are much better than the GT 1000 while being just as good as the much more expensive Kayano. A bit stiff, a little heavy, but at the end of a half marathon I am still standing and walking around without obvious distress or looking like something awful just happened to me. In preparation for the recent half marathon, I replaced the standard inserts with the more cushioned inserts from an older pair of ASICS Nimbus, changing the GT2000-4 into something more of a cruiser or long-distance model. Due to a lack of reflective material on so many shoes these days, I usually use 3M reflective material and reflective laces. 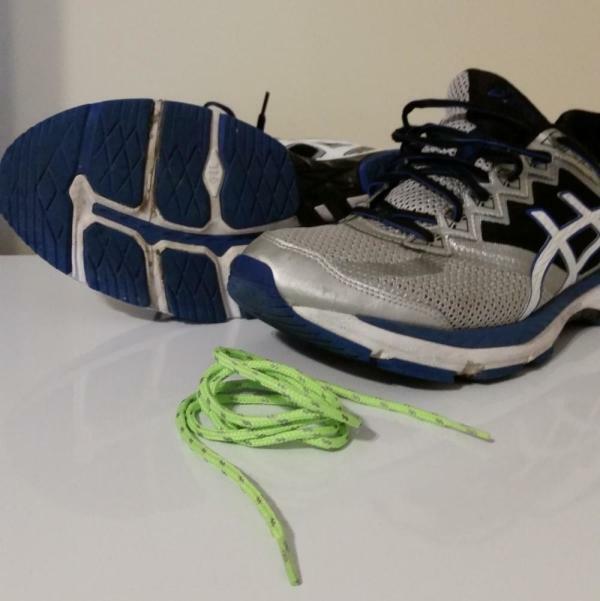 The standard ASICS shoelaces are more stretchy and better suited for an actual race. Nothing is more important than safety when running in the darkness! A clean, good looking and well-designed workhorse of a shoe that is perhaps the best designed go-to shoe for most types of runners. The Asics GT models are great shoes but not as quiet as the Asics Nimbus or Flux models. These are an excellent value even at the full retail price. Changes are so subtle each year than last year's model could be the best deal of the year! This is my second pair of running shoes from Asics. I liked the first pair I had which made me repurchase these shoes in 2016. The GT 2000-4 is the fourth version of the popular GT 2000 series from Asics. I wrote this review in January 2019 and had used the shoe a lot of miles these years. At first glance, one sees that the shoe has the classic side patterns for Asics. It also appears that it is a solid shoe with good shock absorption. The outsole has a good grip that is suitable for varied running. The guidance line that runs all the way from toes to heel helps to distribute the pressure to your foot when striking the ground or pushing off. My shoes are a little bit worn out on the picture, but it still works well on gravel and asphalt despite the worn outsole. The midsole is a twin-layer structure made of lightweight Solyte™ and high bounce SpEVA™. The cushioning properties of Solyte™ absorb impact when striking the ground, while the rebound qualities of SpEVA™ enhance movement into the next step. It has a very durable mesh, and under that a liner, this upper has worked well for me in temperatures between -10˚C-30˚C and has never felt that I was freezing or sweating excessively despite cold or hot weather. I have quite a normal width on my feet, and these shoes are perfect in size. Good space in the toe box and no rubbing against the foot at all. Also used my usual size in shoes, and they were good in length also. The picture above says it all because of the durability of my GT 2000-4. It's the absolute best I have experienced from all the shoes I have owned. It had now logged 2087.2 km and stopped using them when I bought new shoes a few days ago. I usually want my shoes to be able to withstand about 150 km (900 miles) of running which is a very high distance for shoes and so far, this is the only one who passed the distance. As you can see in the picture below, the sole starts to get rather worn but cushioning and fit are still quite good. Although I notice that it has lost a lot of cushioning since it was new when testing my new shoes and compared them against each other. I will keep the shoes and use for my daily walking or bike rides to work and back until the sole gives up completely. And look at the shoe on all my pictures in this review, they are taken after 2087 km of running, looks like new almost on the upper. The shoes have a very good comfort with good shock absorption, and I have used them on all kinds of surfaces. I run on asphalt, gravel, forest paths, trails, ice, and snow. It was slightly slippery on ice but snow and terrain work just fine. Despite worn out soles, I ran 14 km with them on a snowy ground, and it was not slippery, just some when I crossed some icy spots I slipped a little. It’s a perfect daily shoe, and it works for intervals, races and long runs even if I might choose lighter shoes for short races. Asics GT 2000-4 is a shoe that delivers more than I expected when I bought them, it has good shock absorption, good fit and can be used for both competition and recovery and short or long runs. This is definitely a shoe I recommend if you want a versatile shoe with very good durability. So, this is definitely a great update; it's one of my favorite shoes. The lightest 2000 ever made by Asics took a couple runs to break in and then it felt smoother than any previous 2000 I've tested. Just like a sports car. Sizing seems to run just a tad short. Support, protection and cushioning are part of the hallmarks of the GT 2000 4 from Asics. This running shoe gives the runner more opportunity to run in a well-balanced and well-supported way, thanks to very efficient components that make sure each step is as comfortable as possible. Its multiple colorful designs are visually appealing, as well. The upper unit uses a mesh material that is responsive and comfortable. It has a more open construction, so it naturally lets air into the shoe in order to keep the foot cool and dry. The overlay system isn’t stitched onto the upper, thus reducing the overall weight and allowing the foot to move more naturally. A chock-full of mid-sole technologies are placed in the platform. They work together in providing a well-cushioned and stable underfoot experience for those who need greater comfort and additional support. Gait efficiency is also part of this mid-sole’s service as it has specific components that guide the runner through the gait cycle. The outsole unit utilizes two different rubber compounds, which protect the mid-sole unit from the harsh and unpleasant effects of wear and abrasion. One compound gives additional cushioning, though, thus making each toe-off a bit bouncy and more responsive. The Asics GT 2000 4 is true to its size. It comes in men and women’s sizes that adhere to the regular measurements when it comes to length. Its available widths are medium and wide, so runners can actually choose the fit that suits them according to the dimensions of their feet. Its semi-curved shape lets the natural curved shape of the foot acclimate well when wearing it. Similar to the shoe's well-known version, the Asics GT 2000 7, the GT 2000 4 uses the Asics High Abrasion Resistant Rubber or the AHAR® which is made from durable carbon rubber. It’s placed primarily in the heel area. It protects the external sole from wear and abrasion, thus preserving the integrity of the unit. It can handle impact and it doesn’t peel off easily. The DuraSponge® is a blown version of the AHAR®. It’s durable, responsive, and it even gives enhanced cushioning to make each forefoot strike or toe-off more comfortable and efficient. The FluidRide® is a mid-sole technology that’s responsive and durable. It offers a mix of springiness and lightweight cushioning to each step, so the runner actually stays comfortable while landing on the ground and lifting the foot. The Dynamic DuoMax™ Support System is a dual-density foam that helps in correcting the stance of the runner. It acts as a foundation that will lift the arch in order for the foot to assume a more neutral position when standing or when running. The Gel® Cushioning System is a silicon-based gel that’s placed separately in the heel and forefoot sections of the Asics GT 2000 4. It’s there to attenuate shock and make each transition from the heel to the forefoot easier and more comfortable. The Impact Guidance System®, Guidance Trusstic System® and the Guidance Line® assist the foot through the gait cycle. They make sure that the process of going through the heel strike to the toe-off is much smoother and more agreeable. The upper utilizes the Open Mesh, which is a material that delivers high levels of breathability in order to maintain a well-ventilated environment in which the foot can relax. Holes or spaces permeate this material and these act as portals of entry for air to keep the upper and the foot dry and cool at all times. The overlay system has been fused onto the upper unit. They bring structure to the upper material, though they do not limit the natural movement of the foot because they’re not stitched on. These overlays work with the lacing system, giving a customized fit for the wearer. The Heel Clutching System™ is an exoskeletal structure that’s meant to lock the rear of the foot in place. It holds onto the heel and prevents slippage or accidental shoe-removal. The ComforDry ™ Sock Liner is a removable and replaceable insole that delivers additional cushioning to the runner. It can manage moisture well and its anti-microbial capability gives the runner a healthier and cleaner environment that’s free from odor.